I demonstrated in my last post that the odds calculated using the Eastwood Index were slightly more accurate than the bookmakers over the course of the football season. My next goal is to work out the optimal way of using this edge to make a profit, starting off with the Kelly Criterion. The first point of call for any staking plan is the Kelly Criterion, a method developed by John Larry Kelly Jr to determine the optimal bet size based on how far the odds are perceived to be in your favour. The equation used to calculate the Kelly Criterion is shown in Figure 1 where \(p\) is your expected probability of winning, \(b\) is the odds offered and \(f\) is the Kelly Criterion or recommended percentage of your bankroll to bet. Let’s run through a quick example using Fulham’s last match of the season against Swansea City. Bet365 offered Fulham to win at odds of 4.75, which is equivalent to an expected win probability of around 21%, while let’s say you think the probability of Fulham winning is actually closer to 24%. So according to the Kelly Criterion we should be willing to risk 3.73% of our bankroll on this bet. So what is the best way of applying the Kelly Criterion to the Eastwood Index? There are numerous different strategies that could be used but to start off with I’ve gone purely with value bets. For each match I calculated the Kelly Criterion based on the Home, Draw and Away odds from Bet365 and looked for the outcome where the recommended bet was the largest. The reason for this was that the larger the recommended bet then the greater the difference between my probabilities and the bookmaker’s odds so the greater the potential value of the bet. Figure Two shows the results over the course of the season. Starting off with a bankroll of £100 there was a slight loss over the first half of the season followed by pretty steady growth to finally finish with £114 in the bank. This gave a return on investment (ROI) of 14% for the Eastwood Index based on the 2012–2013 premier League season. Being relatively risk averse, I’ve found that using a fractional Kelly Criterion is preferable for me. Although using the full Kelly Criterion is optimal for maximizing growth of the bankroll long term, there is more risk of being caught out by variance and an unlucky streak wiping out your bank balance. Betting a fractional value, such as half the recommended amount slows down growth but helps protects you from volatility. 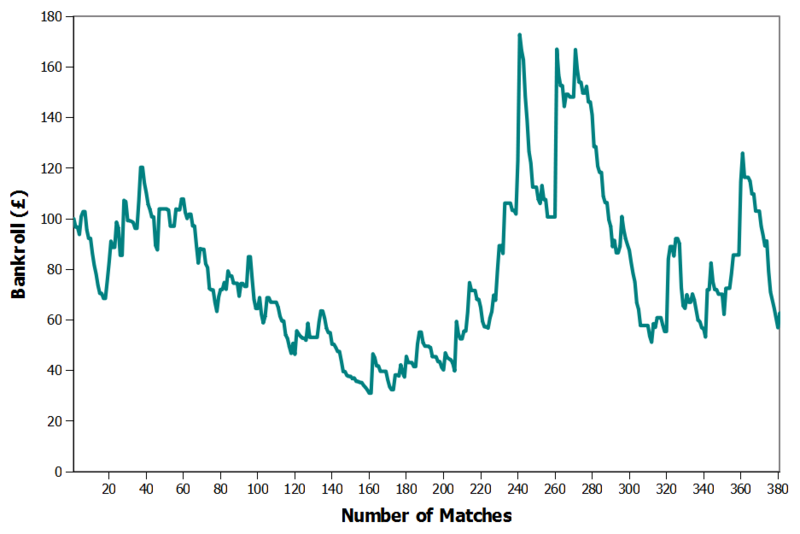 As a comparison, take a look at Figure Three where I bet a full Kelly Criterion on each match and you can see that at its peak the ROI reaches 73%, yet at the end of the season variance has pulled the bankroll down below its starting value causing a loss overall. One intriguing aspect of Figure Two is why the bankroll grew so much more in the second half of the season compared with the first? Partly this may be due to random variance but another possibility is betting on recently promoted teams. At the moment promoted teams take over the EI ratings of the equivalent relegated team so the team promoted as champions take the EI rating of the team relegated third from bottom, the team promoted second take over the rating of the team relegated second from bottom and the team promoted in the playoffs gets the ratings of the team finishing bottom. These ratings will not be exactly correct for the promoted teams but should over time move towards the right levels to reflect the team’s performances. Looking through the history of the bets made though those involving a promoted team during the first half of the season lost money overall while those not involving promoted teams made a profit. By the end of the season I had made a profit out of the promoted teams, suggesting that the team’s ratings had sufficiently corrected themselves. This means though that I could improve the ROI even further by avoiding bets on the promoted teams early on in the season or improving the way the promoted teams ratings are handled, such as correcting their EI ratings faster. This is only a quick look at a very simple strategy for placing bets using the Eastwood Index; there are still plenty of improvements that can be made to improve results further. Yet even with this relatively naive approach the ROI is 14%, which is much more than I would have made sticking my money into a bank account. Applying the Eastwood Index to betting is also a great ways to identify the strengths and weaknesses of the model as the ROI gives a clear indicator of what works, what doesn’t work and what can be optimized further. I was asked on Twitter what the ROI works out at per bet for the Eastwood Index without betting the Kelly Criterion. Using a fixed bet of £1 per bet gave an overall profit for the season of £17 over 380 matches, which works out at an ROI of around 4.5% per bet. I used your EI for betting purposes for the last few weeks of the season and obtained 21% ROI, so i must have been lucky in picking a good week to start. Have you any plans to work out the ROI for specific situations? 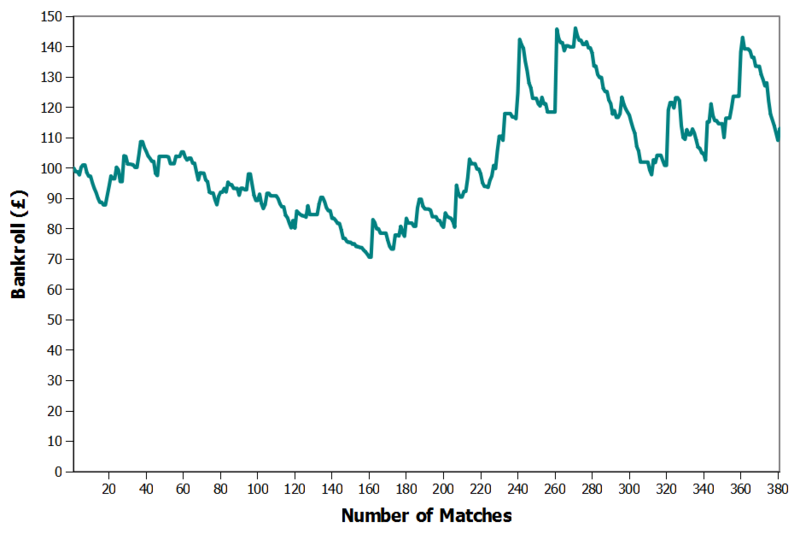 For example just looking at when the ‘value’ selection was a home win, draw, etc. so that you can see where your model is better than the bookies and where it isn’t. Or, do a graph with each teams ROI to see if anything sticks out. Good idea, I’ll try and take a look at those over the summer! Agreed, one year’s worth of data is certainly not definitive for football.